By Dennis W. Viau; modified from a chef’s recipe. Many years ago some friends took me out to dinner at a seafood restaurant (the one that looks like a warehouse, as described in Douglas Adams’ book So Long and Thanks for All the Fish). I had a seafood and fettuccine dish that was delicious. I asked the waiter if the chef would be willing to share the recipe. The chef came to my table. "I know a food is good," I explained, "when the last bite is just a delicious as the first, when I was hungry." When I asked for the recipe, he said, "I can tell you how to make enough for 40 people." Instead, I asked for the ingredients and I worked out the proportions myself. The original dish included bay scallops, which can sometimes be difficult to find. I make it without scallops. I prefer to cut large shrimp lengthwise, as this causes them to curl more when cooked, which helps them hold more sauce in their shape. This helps deliver more sauce to the mouth. Heat the oil and butter in a large skillet over medium-high heat. Add the garlic and cook less than a minute. Add the shrimp and cook only until no longer translucent, about 3 minutes. (Do not overcook, as this makes the shrimp tough and rubbery.) Remove from the skillet and set aside. Place the cream, sherry, oregano, rice flour, pepper, and salt in a bowl and mix thoroughly with a whisk. Add to the skillet and heat until it starts to boil and thicken. Remove from the heat and mix in the cheese to melt. Add the shrimp and mix to coat well. Cook fresh made fettuccine about 1 minute in boiling water, or cook dry pasta according to the package directions. (There is a recipe for Pasta From Scratch in the Recipe Archive in Basics.) Drain the cooked pasta. 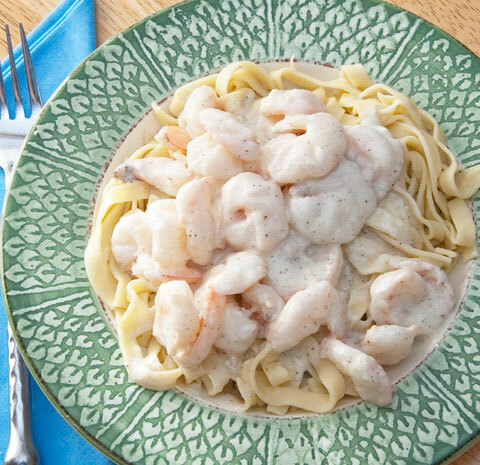 Arrange on a serving dish or individual plates and spoon the shrimp and sauce mixture over the pasta. Although this dish can be served with additional grated cheese on the side for garnish, there is enough cheese in the sauce to make this unnecessary.